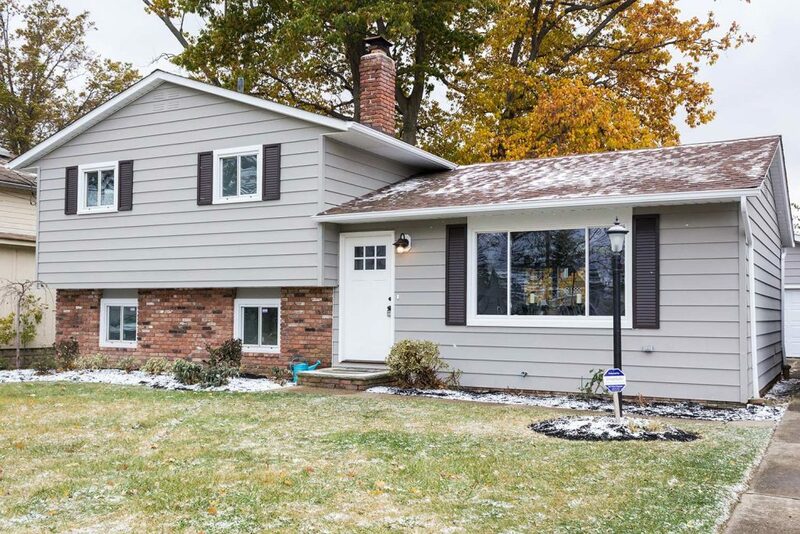 From linoleum to modern WPC vinyl, this traditional split style home turned into a first-time home buyers dream. 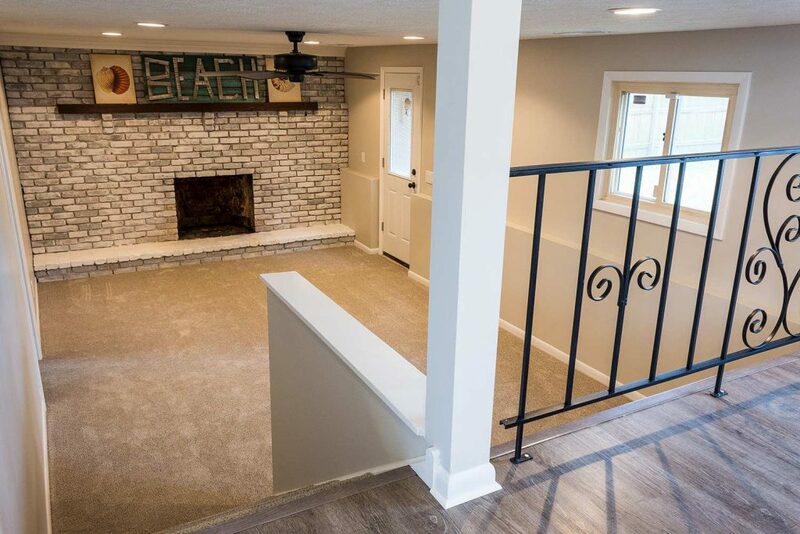 Our friends at the Wright Group Real Estate are expert house flippers and saw the potential in this family home right away. This three bedroom, two bath home features an open main floor with a living room, dining area and kitchen. From the main floor, the home opens to a split level design with bedrooms on the second floor and more entertaining space below. 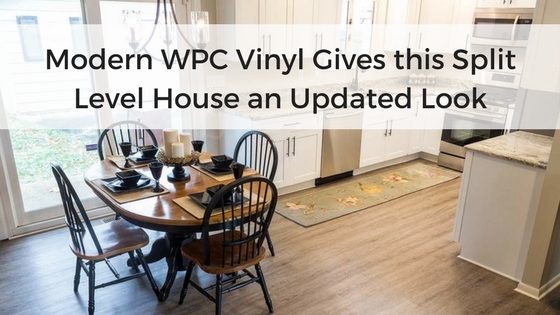 Knowing this would most likely be a family home, the Wright’s went with a modern, 100% waterproof WPC vinyl to withstand anything the homeowners would experience and be easily maintained through kids, pets and entertaining. 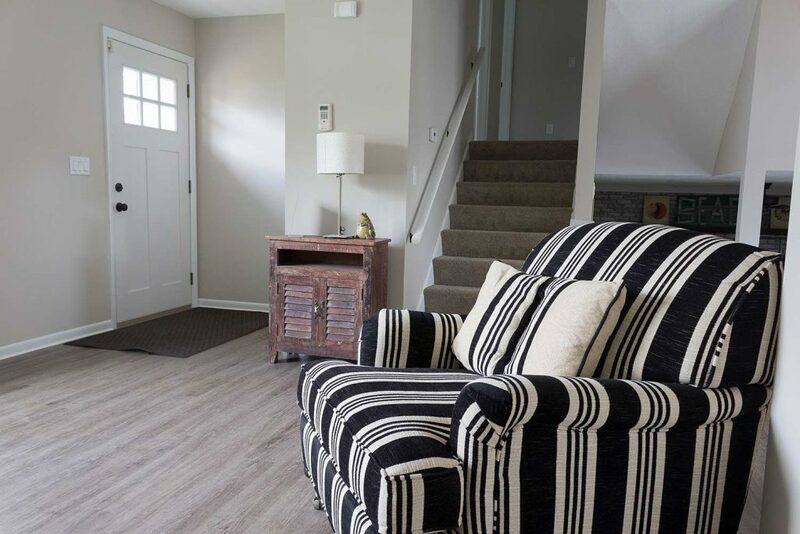 The Anchor Light Barn Oak is a wood plastic composite (WPC) vinyl that has the stability of a laminate with the waterproof capabilities of a vinyl. It has a 5.5mm core with a 1.5mm vinyl top coat that is easily installed by click and lock. This floor withstands heavy traffic, stains, pet accidents and water. Let’s take a closer look at the finished look! The front door opens to an open floor plan, including a sitting room, kitchen and dining area. A bright picture window gives the sitting room a beautiful warm glow. 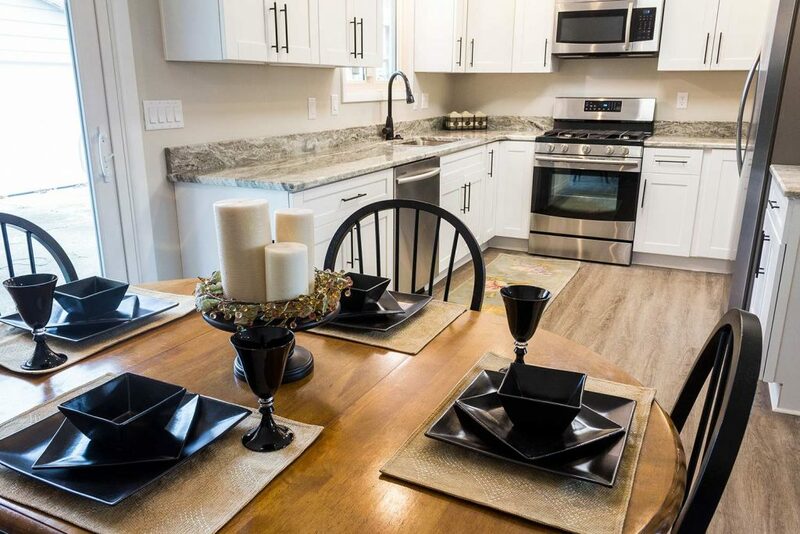 As you continue into the home, it flows into the dining room and kitchen. The dining room features large sliding glass windows to give the space even more natural light. 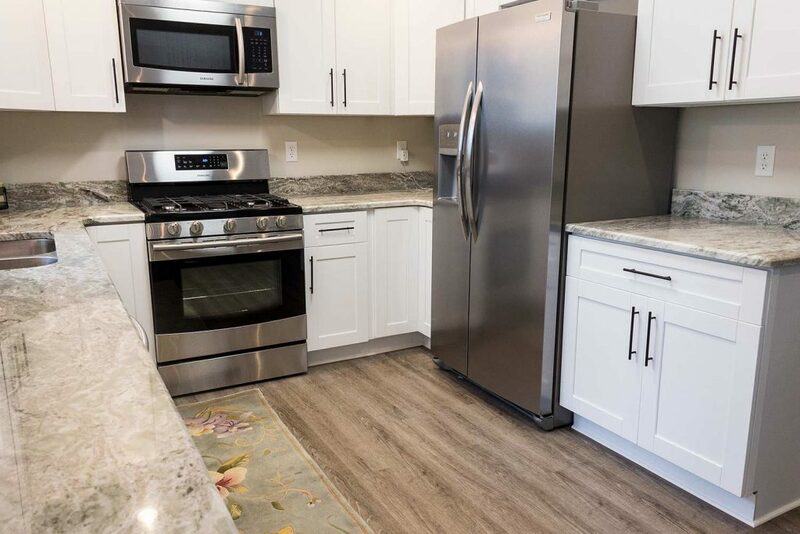 The dining room is connected to a high-end white kitchen that features stainless steel appliances, plenty of storage space and granite counter tops. 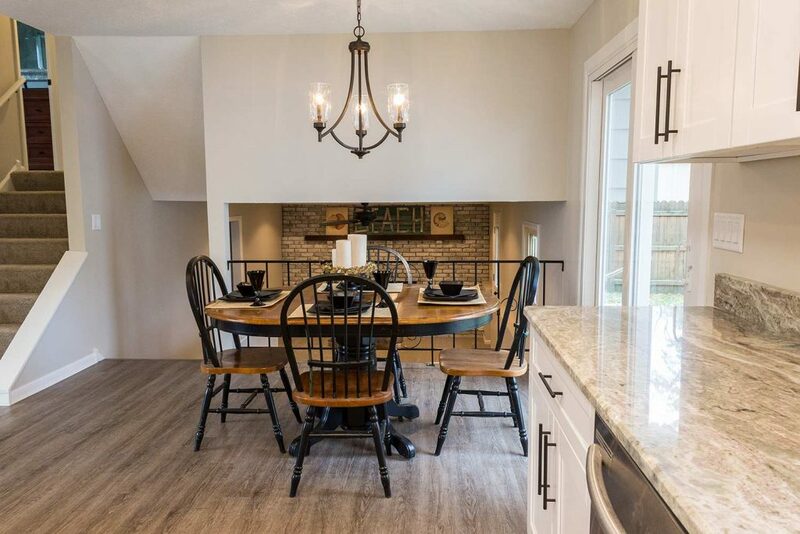 Cooking would be a breeze with all of the counter space! 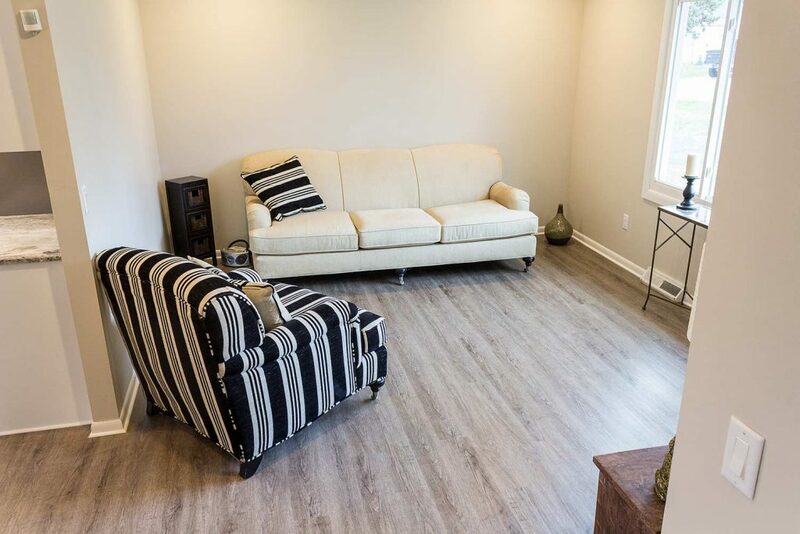 The light brown vinyl gives this space a neutral and modern look that combines all elements of the home together. 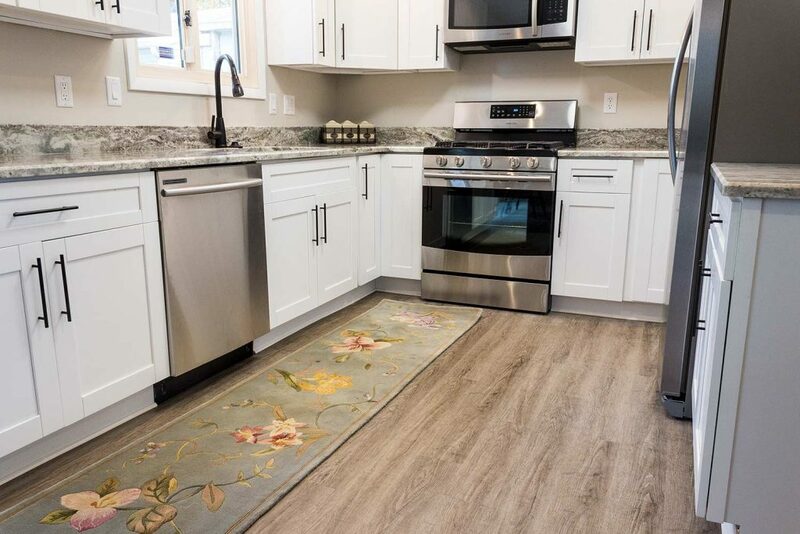 This kitchen sure came together! Take a look at the in-progress look before the floors, counters and appliances. The main floor then opens up to the downstairs entertaining space and three upstairs bedrooms. 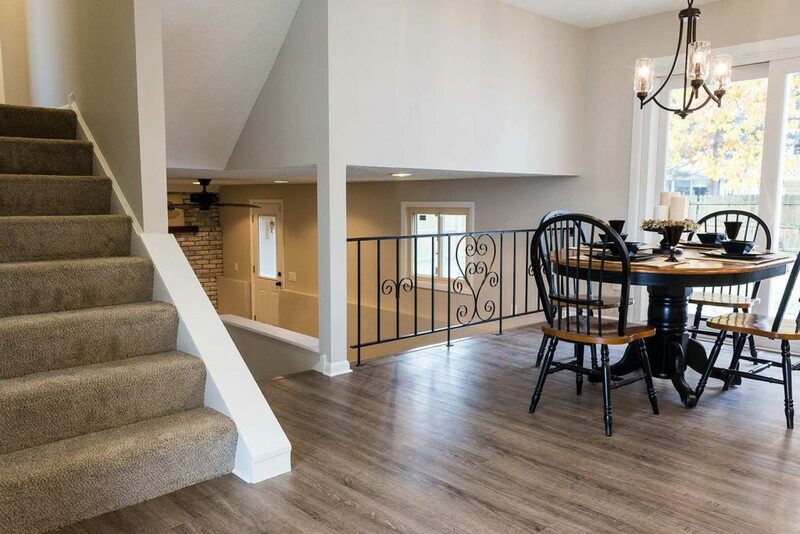 We love the end result of this house flip with the modern WPC vinyl flooring! Are you a fan of this look? If you’re looking for a floor that will withstand a busy household, we have some great options here. Hey Alana, Thanks for sharing such an useful information. It really helpful to me. I just loved this article. Keep up the work. We are happy to hear you found this article helpful. We love sharing our customers projects!